Location Location Location. 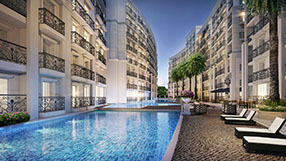 The new low rise 8-storey project named “City Garden Olympus” by the best developer in Pattaya “Global Top Group” definitely has great central location on Soi Kho Pai 4 with a 2nd entrance on south Pattaya Road. Close to shopping, international schools, walking street, Tukcom, Big C, Homemart, Tony’s gym and in walking distance to Pattaya beach. 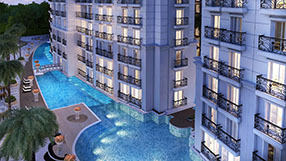 This is another top quality project by Global Top Group and it is still time to reserve a unit for personal use or investment as this is prime rental location in Pattaya. This quality luxury condominium consists of 6 buildings with the largest swimming pool in Pattaya and will be completed in the 3rd quarter of 2018. 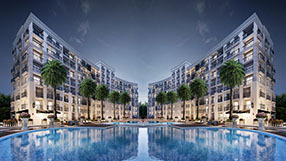 The developer Global Top Group has been finishing their earlier projects before completion date with best quality construction in Pattaya Thailand which makes Global Top Group the number one choice for investors. 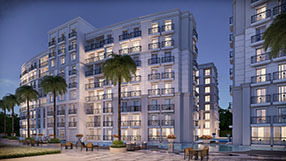 Available for sale are studios, one bedroom & two bedroom condos with modern European kitchens & interior furnishings. 5 swimming pools including the largest swimming pool in Pattaya, Jacuzzis, saunas and steam rooms, golf driving range, badminton courts, children play ground, gyms and yoga room.